Co-writers Matthew Spangler and Benjamin Evett bring us this bold new adaptation of one of the greatest poems ever written. 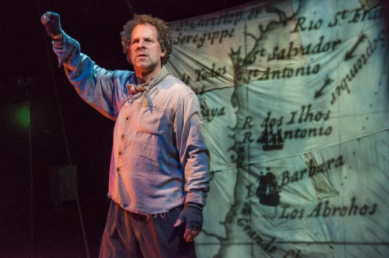 Called “Captivating” by The Boston Globe, it brings us face to face with the Ancient Mariner, doomed for eternity to retell his harrowing story of an old ship, a voyage to the bottom of the world, and a mystical seabird. It’s a rollicking sea yarn, a fascinating character study, a celebration of storytelling, and a spiritual odyssey into the interconnectedness of all living things. Nominated for three Elliot Norton Awards, including Outstanding New Script, Outstanding Solo Performance, and Outstanding Production. Produced by Poets Theatre.